Discussion in 'Books, Films, TV, Radio' started by wtid45, May 4, 2009. Tht's bad luck indeed ! Wanted a decent Rolleiflex for my camera collection for years... not cheap. Couple of years ago saw a lovely 50's one at a carboot with a load of other accessories & case, bloke wanted a tenner, I only had a fiver. Not been to carboots much since then, too irritated. 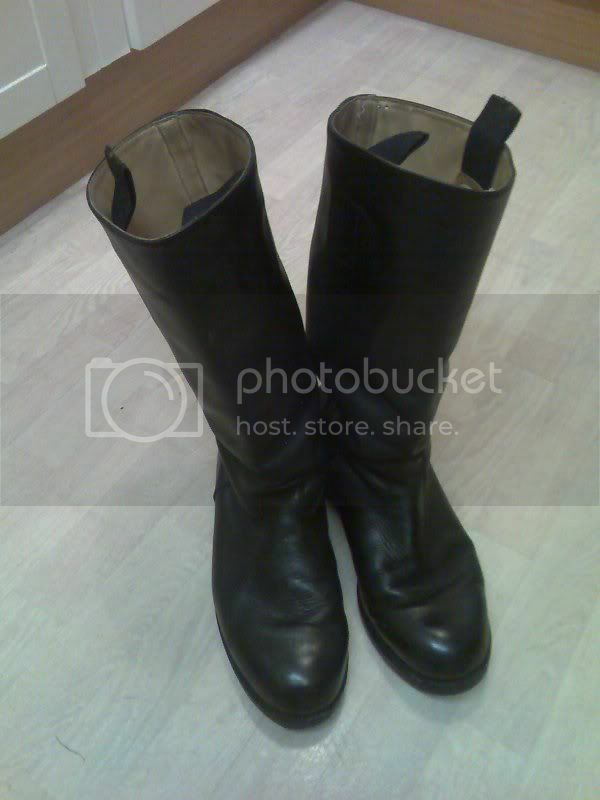 ...a pair of Wachbatallion boots, brand new...£20!!! Always unsure of sales. Saw a dealer with three WW1 Princess Mary tins. All were gleaming brass and looked brand new. Wanted £25. For those of you that are familiar with brass products, would an item some 95 years old still be gleaming as new and have perfect detail on the lids? Should there be wear from polishing? in order that you fully understand the value of missing out on a real bargain! I'm waiting for some pictures from Andy. blacksnake As old as I feel. Ah these things happen. dont let it eat you up!! Car boot sales arent as popular in Ireland although there are a few about. I should make more effort to go to them. Cheers for that-Just ordered a 1943 First Edition, bit more than 20p though. Well mine is a March 1944 reprint........... and it was your good self that prompted me to pick it up the title caught my eye and at first I thought it was a book about Dunkirk and those little ships, it was not until I looked inside I saw it was about the MTBs but intresting all the same. ...and the boots are still going strong! Moral of this post is If going to a car boot sale take twenty pounds with you so you can by the unexpected little finds. PS I like church coffe mornings the wife gets a coffee I browse the second hand books amazing what you find.